—Coach Todd Haley on his team’s performance in losing at Indianapolis last Sunday. Maybe Todd Haley is too content with his team’s play. Playing not to lose. Squandering your QB’s best performance in a Kansas City Chiefs uniform. The Chiefs offense opened the door for a victory to enter in, however, the defense could not close the door shut on a win, Texans comeback in Reliant Stadium on Sunday. 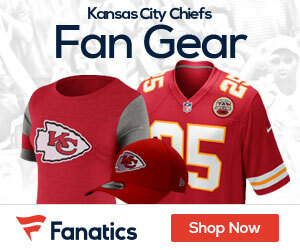 The Chiefs blew a 31-21 lead in the fourth quarter, in a game which the offensive line dominated the line of scrimmage. 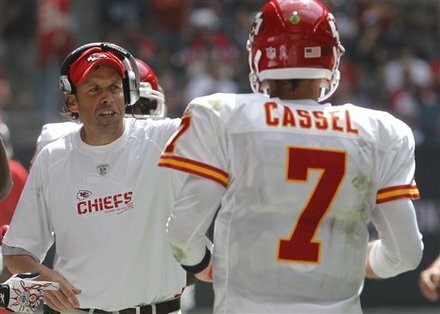 Cassel threw three touchdowns, the run game produced 228 yards on the ground, and everything looked good. Until the defense choked. Dwayne Bowe actually had an excellent performance. I was thinking, boy, if he’s having himself a game, the Chiefs are a lock to win. He was the key missing ingredient to the formula, a.k.a the Chiefs aerial attack. The run game was going full steam, the pass game was finally clicking, but something was missing. All was well, right? That was until the defense was forced to make a crucial stop. When put into the position, they couldn’t. They didn’t. They wouldn’t. Whatever it was, whoever was to blame, the bottom line was this: the Chiefs defense failed. After taking the lead following a Cassel to Bowe 42-yard score, the Texans set up shop at their own 34. It took three plays to cut the lead to 21-14. Derrick Ward hit the end zone running on a 38-yard scamper, in which he broke several would be arm-tacklers from the Kansas City defense. It was a sign of things to come for Crennel’s crew. Fast forward to the latter part of the 3rd quarter with the Chiefs up 24-14 after a Succop 24-yarder. 4th & 1 for the Texans on the Chiefs 37. Schaub made a throw that changed the momentum and whole complexity of the game. He dropped back, and then located Owen Daniels for 9 yards and a first down to the Kansas City 28. More importantly, he put the Texans in control of the game. By that I mean, his completion turned the game around from a “Chiefs in control game” to an old wild, wild West shootout type of a game. Despite Cassel’s theatrics earlier in the game, this was not what the Chiefs, defense wanted to get into. Even with a talented secondary, if it got into “shootout mode”, the Chiefs could not win the game. Entering the the game I was more confident in the secondary than I was in Matt Cassel. Now, exiting the game, I am more confident in the QB than I am the defensive backfield. Not good considering your best shot of winning the AFC West is with a bend, but don’t break defense and a solid ground game; not reliant upon a high-scoring aerial attack. Following that 4th down conversion, the Texans went on to score their first of three touchdowns in the game’s final quarter. 15 minutes, 21 points. The Chiefs defense played could have been likened to its head coach’s beat after the 19-9 loss to the Colts last week. They played to the tune of his “content-like” mentality. It was a game where the Chiefs could have shed that label, and really emerge and solidify their status as a legitimate contender. Now after the 35-31 loss, we don’t know what to label them as. Their contender status could be summed up in one word: content. Content, because that’s the how their defense played with the lead in the 4th quarter. In essence, playing not to lose translates into: playing not to win. Following the lead of the coach. Contentment doesn’t win you the AFC West, Todd. @Nate – You’re way off… The problem with sports fans is that they NEVER want to hear the areas their team needs improvement when they are winning… And when they are losing, they NEVER want to hear about any small positives. Smaller blogs tend to take a realistic approach to writing blog posts. If you want all sunshine and rainbows, go over to SB Nation or read Josh Looney’s blog on the Chiefs official website… But also read the smaller blogs, who are more likely to tell it how it really is and not solely protect and defend the team with everything they write. Nathan is right on the mark. Yes, our D cost us that game for the poor play in the forth. The reason why Todd says we are a transitioning team is because of how young and inexperience the team is. There were alot of positives in that game even though we lost. To say our team reflects our head coaches attitude with not tryin to win is BS. And it doesn’t look like Nate is upset that the team needs to improve Travis, he simply says this team is young and is going to have inconsistanceys. Hey Nate, the playing not to lose, not to win part was directed strictly towards the defense not the offense. I applaud the offense’s performance. I love the Chiefs. Obviously you haven’t read my other posts. It was just too frustrating to see them blow a game they played so well. It was very frustrating to see the Chiefs blow a big lead. BUT, I do see so much improvement in our play that it’s hard to get down too much. The defense’s meltdown was definitely a flashback to the Chiefs of the last few years, but the improvement in offense and the play of the defense in the first five games is a VAST improvement. So I can see where Hailey is coming from, and I believe his plan is working.